Powerstown Educate Together N.S. places great emphasis on pupils being punctual to school. Here at Powerstown Educate Together National School our expectation is that pupils arrive to school between 8.20am and 8.29am to the supervised assembly area. Children are then received by class teachers at 8.30am and brought straight to class to commence work. Being late for school negatively impacts on your child’s learning and behaviour. When late, your child arrives to class upset, disorientated and disorganised. He/she is embarrassed at interrupting the class, often requiring reassurance from staff, has missed his/her morning meeting and first instructions for the school day. Being late for school means your child is missing out on learning experiences, especially in areas of Maths and English that are often taught early in the school day! Lack of punctuality has an impact on all other learners as it disrupts the class, and the teacher is required to give directions to late pupils, often console the late pupil and then recap on missing learning. This reduces learning time for the rest of the class. 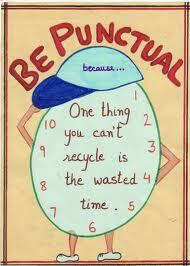 Punctuality is also a key workplace skill which must be learnt at school and adhered to. Employees who are regularly late to work lose their jobs. In the work place you cannot arrive at the start time, you must be in the work place prior to the start time and ready at your desk or work station for the official start time. This principle holds true in school. Therefore those pupils who enter our building after 8.30am are deemed late. Children who arrive after 8.40am must be signed into school by a responsible adult. Lateness of children is recorded by class teacher. If problem persists, parents will be asked to meet with class teacher. If puntuality continues to be a concern, parents/guardians will be asked to meet with principal and a plan will be drafted to address the area of punctuality. Punctuality concerns are reported to the Educational Welfare services similar to attendance concerns (click here). Please support us in ensuring your child arrives on time, and organised for the busy school day ahead.